Douglas Sirk is the king of the 1950s melodrama, and also one of my favorite directors. Pair that with Lauren Bacall, who I delusionally but lovingly refer to as the queen of the world, and Rock Hudson, the king of pretty 1950s men, and you’ve got some pretty high expectations coming from me. The film follows alcoholic oil man Kyle (Robert Stack), who marries Lucy (Bacall) despite the fact that his best friend Mitch (Hudson) is in love with her. After Kyle and Lucy marry, Mitch is pursued by Kyle’s overly-frisky sister Marylee (Dorothy Malone). Oodles of drama ensue between these four characters. I rented the Criterion Collection release of this film from my local library. It was one of the only Bacall films I hadn’t seen, so I was elated to discover that they had a copy for me to borrow. And I must give props to the Criterion Collection, whose steady release of films in phenomenal quality and with interesting features has provided me with many hours of entertainment and will continue to do so. This release is not a disappointment on their part. Picture quality is phenomenal as usual (which I was hoping for, because Sirk always makes a fantastic use of technicolor, which I will discuss further in a bit). Criterion enhanced the film via a digital transfer, to make it better suited for the dimensions of today’s televisions. The special features are a treat. My favorite of them, “The Melodrama Archive,” is a complete annotated filmography of Sirk, detailing his films both in Germany and in America. Slides detailing each film accompany hundreds of photos, including behind-the-scenes shots and vintage lobby cards. Also included are a booklet by film theorist Laura Mulvey and a few original trailers for Sirk films. Unfortunately, this film didn’t live up to all of my expectations, no matter how much all of the Criterion bells and whistles wowed me. It is a gripping and entertaining film that comes with many positives, but in some ways it just falls short. I’ll start with the positives. All of the actors give quite solid performances. Particularly striking is Dorothy Malone, whose performance reminded me of Joan Crawford in The Women (1939). Malone won an Academy Award for her performance here, and rightfully so. Just as striking as Malone (and probably even moreso) is Sirk’s use of brilliant technicolor. Ultra-saturated shades of yellow, red, blue and hot, hot pink hit the eye like a freight train of vibrancy. Sirk’s use of color is always great, enhancing the over-the-top emotion that is characteristic of melodramas. They are an exaggeration of reality, and so Sirk uses colors that are much brighter than we typically see them. However, not everything shines as bright as this brilliant technicolor flare. Though I mentioned that the performances are all solid, I couldn’t help but feel that the actors weren’t reaching their potential. I’d seen many of their films prior to this and was a bit surprised that none of them amazed me. This is far from Sirk’s best film. It is emotional, it is full of drama, and it is enjoyable, but it lacks the punch that I feel while watching many of his other films. I tend to compare every Sirk film that I watch to my favorite, Imitation of Life, which blew my expectations out of the water and has done so every time that I’ve re-watched it. It’s unfair to do so because I love that film so much and will obviously hold a bias for it over other films, but quite a few of the Sirk films I’ve seen have at least come close to the Imitation level of awesomeness. But this one didn’t even come close. 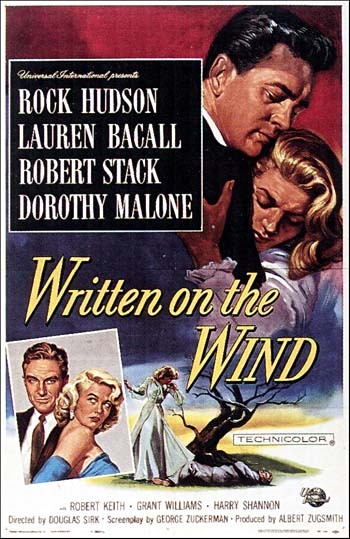 Written on the Wind is still worth a watch if you like melodramas, but if you’re looking for a truly great film, search out another one from Sirk’s filmography. Ed. note: “Reviewin’ the Box” is the name I’ve decided to use for reviews in which I also review DVD quality/special features/etc. These will sometimes be written in conjunction with a New to Me in 2012, as is the case here, but will sometimes be written for newly released classics/favorites that are new to my DVD collection as well.